I think I should have done that search about 4 months ago. Patiently suffering does not sound like a good idea. The North Face Endurance Challenge is known for its trail courses of 5K to 50 miles. 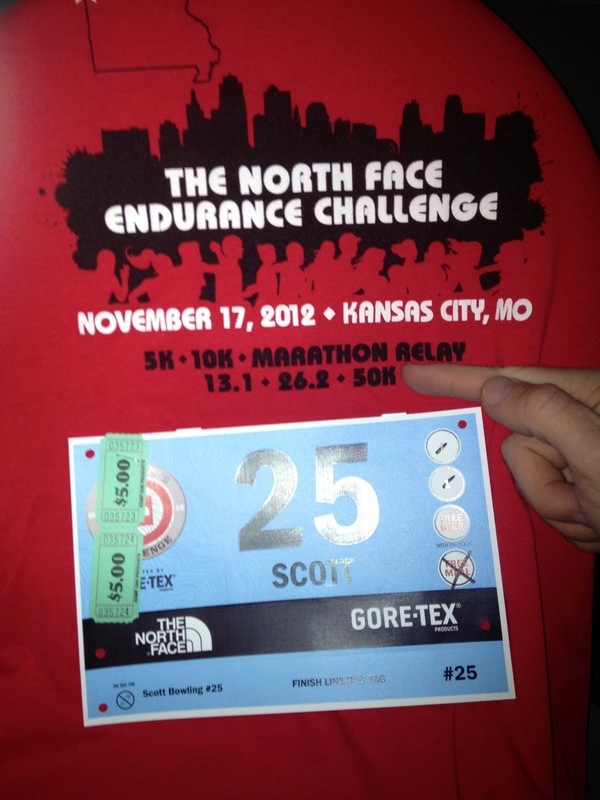 Last year they added a road race in Kansas City and I put together a relay marathon team. Tons of fun. I decided to give the 50K a shot this year and convinced Joe VI to do the same. A 50% off coupon made the cost of the 50K and marathon the same. So if we decided to go down to the marathon, no big deal! It is only 4.8 miles more than a marathon (if you don't know the distance of a marathon, I'll let you Google that). Could running 4.8 miles more be that more difficult? Let's see. Leading up to the race I started my carb loading by boiling a full pound of whole wheat pasta to eat with every meal. I also throw in some smoked chicken meat to add some protein. I start to over hydrate myself this week as well. On Friday I had many people asking if I was excited about the race. I really was indifferent. It was as if I had no race at all. It was really weird. TKB and I went to Italian Delight for dinner. 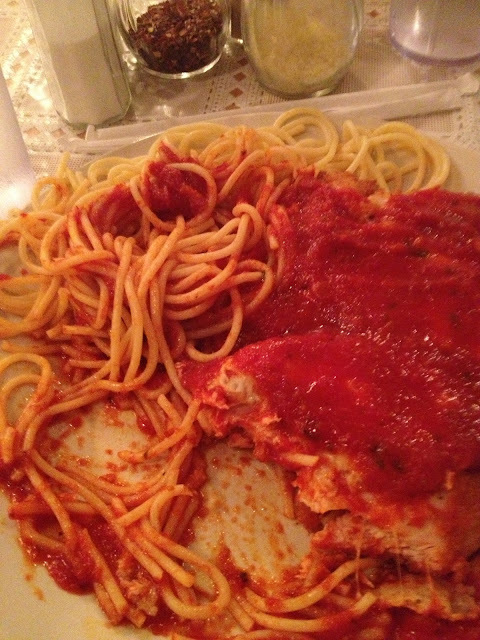 Since I had been carb loading all week, it wasn't that critical to actual eat pasta, so I ordered a Chicken Parmesan with a side of spaghetti. I really like their Chicken Parmesan and definitely recommend it! We went back home, watched a movie, and was in bed by 10pm. I slept surprisingly well. Probably not the best advertisement. Typical pre-race breakfast and we were on the road by 5:50 to stop at the local barista for my last pre-race pick-me-up. I love Pumpkin Spice Latte season! Pumpkin Spice and Everything About To Get Painful. I dressed in the same outfit as Chicago, but I added my Zensah calf-sleeves and the free The North Face arm warmers. While I was a little worried wearing the arm sleeves causing overheating, they were much thinner than the ones I wore for Beach2Battleship at warmer temps. We arrived at Theis Park around 6:30am and my first pit stop to the port-a-johns. After which we met up with Joe VI & Lauren (running the 10k), Kristen (running her second marathon! 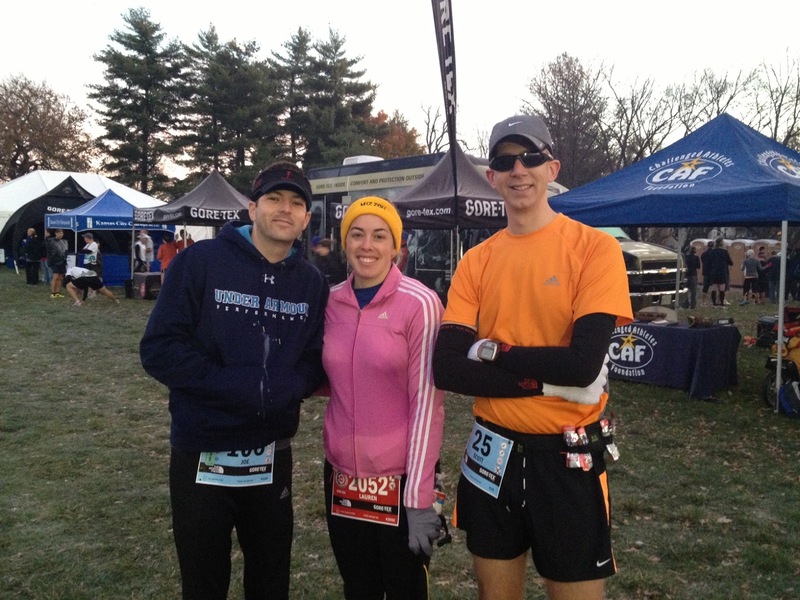 ), Bryan (another co-worker who just finished a 50K trail race a few weeks ago and doing the 50K here as well), Ashley (running her second marathon since having a baby about four months ago) and Ryan (first 50K). Eventually Joe, Ryan, and I made our way over to the start line. Race time was 7:00 and sunrise was 7:05. Fortunately it was light enough so I could wear my sunglasses. It was going to be a long day without them. Unfortunately, something else wasn't working so well. My Garmin had been "starting up" for about 20 minutes. It was still stuck on the start up "Garmin" screen. My pleas to the race director to hold off on the race were ignored, granted I didn't actually say anything. A little after 7:00am, we were off! This time they started the race on the street. Last year they started and finished in the park. Apparently that was a little too "traily" for some people? This is a road race after all! After about a tenth of a mile I heard my Garmin beep and it was ready to start recording the oncoming 31 miles of torture fun. Yeah. I'm covering the first half of the race in this section. This was probably the most fun I have ever had on a race. Joe VI and I were having a great time joking around with pretty much everyone we saw. We were debating on what would go out faster, our legs or our attitude. Didn't matter, we were enjoying things. Mile 13.2 Split: 1:57:49 or 8:56 Pace. Pretty good pace. While I had sketched out a race pace plan, it was really more about not running too fast/hard and we were being successful with that. One issue we discovered is the mile markers for the half marathon and those for the full and 50K were switched. Ours were showing at the half mile point on our watches. Something was amiss. Since we didn't really have hard time goals, it didn't matter but was rather annoying. My watch was already off by a .10 of a mile because of the startup issues. Some of our jokes were leading to the various "don't poop yourself" variety. We were both having some issues there. I guess I should have only eaten half of that chicken last night. We debated on running into stores or malls. We stopped at one aid station but there was a line for the bathoom. Eventually we stopped at the aid station in the River Market and took care of some business. After a mile of the aid station, I realized I still needed to pee. What? I spent so much time taking care of the #2, I forgot about #1. My priorities were definitely in reverse order. This was pretty much all uphill. It was disgusting but the scenery was beautiful. I will say that there was some weird misdirection going on for me during Cliff Drive. I knew it was uphill but it actually felt flat to me. It was at this point that I lost Joe because I was probably running faster than I should have. When we got to the end of Cliff Drive, I heard footsteps behind me and turned to talk to Joe and it wasn't him. I ended up catching up with a guy who was from Bismarck, ND. We chatted for about 4 miles or so as we matched pace pretty well. He then dropped me on another nasty hill. At this point I dumped my gloves at an aid station, hoping I wouldn't regret it. We started the eventual turn back towards the finish. I was doing surprisingly well. I was hitting a decent pace and had caught back up with the Bismarck runner. I was starting to think about the fact that I was about to run farther than I had ever run before! Around mile 23 is when we met back up with the marathoners. It was good to actually have some more company on the road. 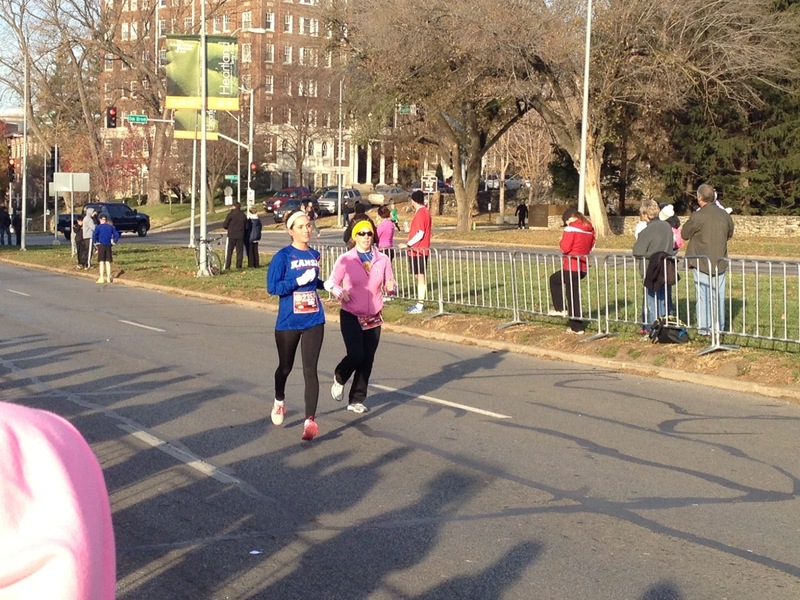 Because of the pace I was running compared to the marathoners, I was actually running a minute per mile faster. This meant that I could entertain myself by catching and passing people. Also known as the runners fishing game. It was also this section of the course that we could tell it was the high point of the elevation. Any time we got into a clearing there was a strong wind. Unfortunately, it wasn't at our back but our front. I ate a gel at mile 20. I was also getting close to the last relay station. This means I was running the one part of the course I was familiar with as I ran the last leg in 2011. The Bismarck guy stopped for a bathroom break at the relay station and I trudged along. 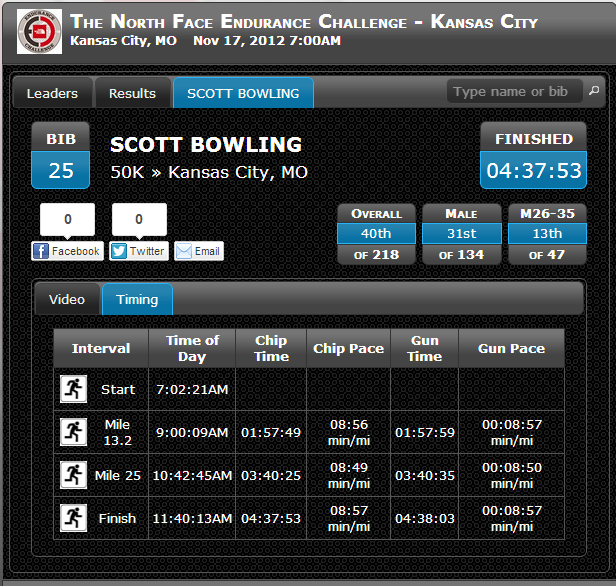 Mile 25 Split: 3:40:25 or 8:49 pace -- Nice! A negative split! It was at this point that I finally saw someone I knew on the course. Kristen! I almost missed her too but managed to say "hi" as I passed. I was also playing leap frog with a female runner. As we were approaching Crown Center (ie, Hospital HILL) she said something like "almost there!" to me. I said, "not until after this hill". Apparently she had not run a race that included this hill before because she started asking all about it. Once we hit Hospital Hill I immediately turned to a fast walk while she kept running but eventually walked. I had planned to take a gel at mile 25 but never did. Eventually my fast walk passed a couple guys hanging out at the aid station, appropriately placed at the mid-point of the hill. 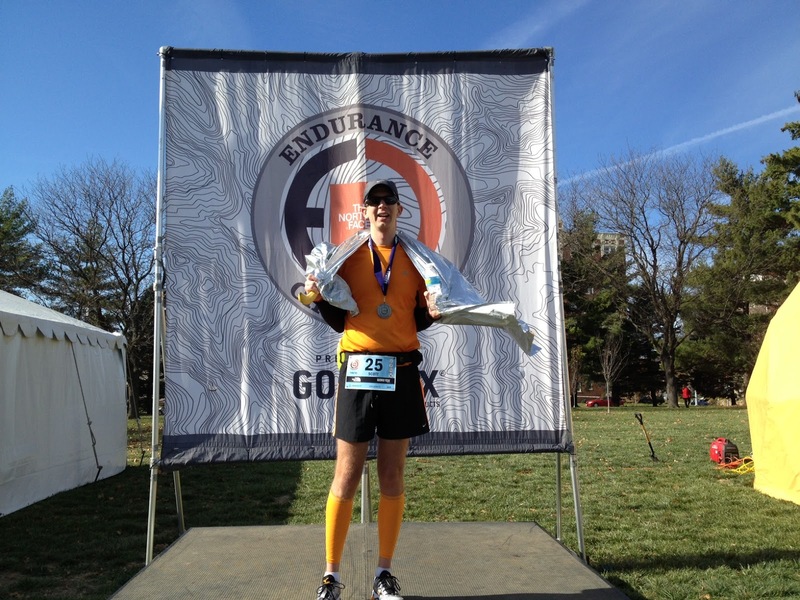 It was Bryan who was running his second 50K in about 3 weeks. It was really at this point that I kept up sustained walking. I had done really well trying to keep up the running because I was afraid that once I started I couldn't get back to running. Since I was on the home stretch I knew I had plenty of motivation but I decided to walk anything that resembled a hill. The mile markers appeared to still be messed up. They had the marathon and 50K mile markers on the same sign post (granted about 5 mile different) so I was curious which one was correct since 50K is a smidge over 31 miles and a full marathon is 26.2. Was I going to run an extra .2 miles? Still walking the hills when I found them. I was eventually in ear shot of the finish line music and decided that was enough motivation to keep me moving. I remember this part of the race very clearly from last year. Which is the last quarter mile is all downhill. I could easily see that I missed my goal of 4:30 by 7 minutes. It didn't matter. I was done!! They turn you through a chute where someone hands you a bottle water. The lady asked me if I wanted two, in which I replied no so as to leave some for others behind me. She probably had 1,000 bottles of water with only a couple hundred people still on course. Oh well. I picked up a space age mylar blanket and entered the post-race food area. They had bananas and apples, as well as more Gu Brew and water. I'll take a sub-9 average pace for a 50K. It's funny how running 4.8 more miles required over an hour of running compared to Chicago; however, we met the total elevation gain of the Chicago Marathon within the first mile. We were also racing this to do the distance, not meet a time goal. My legs were definitely not happy. 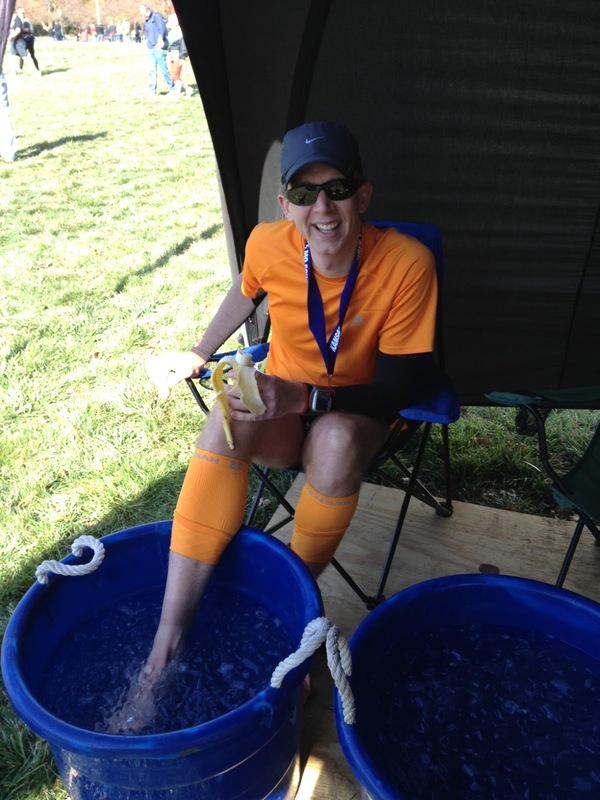 They had ice baths available, so I stuck my feet and ankles in them for a few minutes. I didn't fully emerge my legs because it was simply too cold out and I was feeling miserable enough. After I got out, I saw Kristen's husband Jeff heading over to the food tent so we waited for Kristen to get through. Just standing there talking for a few minutes was horrible on my legs. I had to keep moving. So we meandered through the booths and I found the food trucks with the post-race food. 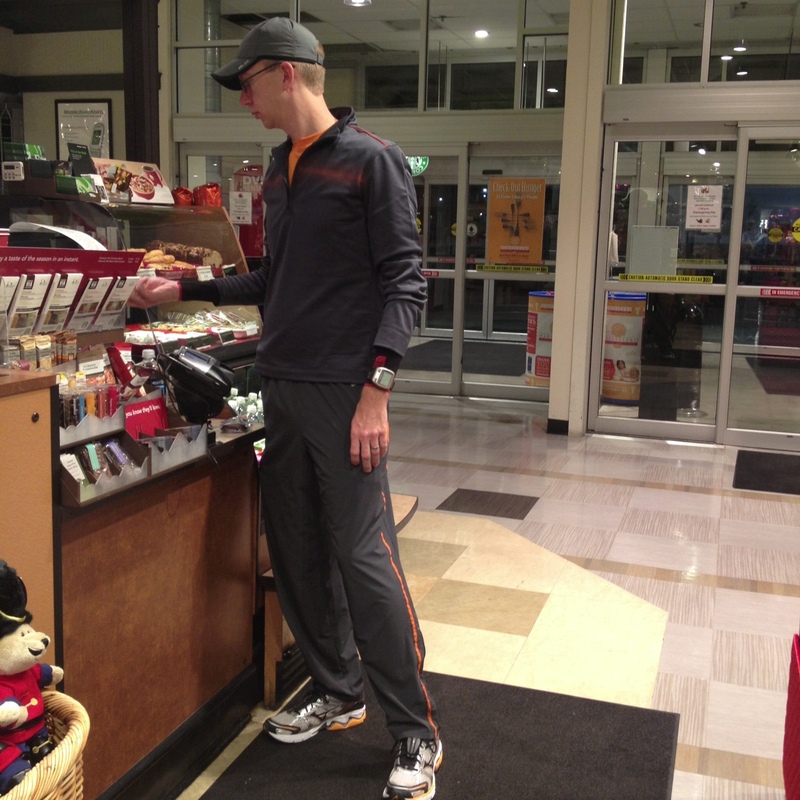 Since I ran the 50K, I got $10 in food vouchers. I bought red beans, sausage, and rice. We met up with Lauren and the kids by the finish chute. She had finished her 10k, gone home, showered, rested, and returned to the race while Joe and I were on the course. With the Glympse -- GPS tracking -- software that we use, it was easy to see where Joe was on the course. Tucker, the husband of one of my friends from my high school years, stopped by as he was waiting for Breann to finish her first marathon. We chatted a bit while I watched Ryan and Joe cross the finish line... with my legs still screaming at me. I don't think my legs have ever felt that miserable after a race. I finally decided it was OK to sit down to see if it helped. It was pretty windy at the park and Joe had found a nice place to block the wind. We eventually took off for his house to clean up. During the post-race, Joe commented how blue my lips were. It wasn't until 2pm (2.5 hours after I finished) that they returned to normal color. After we got home I immediately got in bed since we had an evening of socializing ahead of us. I had been wearing my compression socks since getting out of the shower and also took a Meloxicam (like taking 18 Advil). When I got up from my 3 hour nap, my legs were doing quite well. I think wearing my calf compression sleeves aided in that as well. I never had the "my calf muscles are going to fly off" feeling during the race. My legs were probably equivalent to that of the day after the Chicago Marathon. My left ankle felt "weak", which I actually experienced after Bringing Up The Rear 5K a few weeks back. That is a fabulous time for your first 50K!!!! I won't tell you mine (7:30 I think...) Awesome!! !